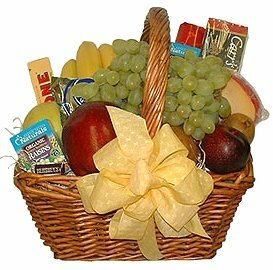 This basket includes a variety of seasonal fruit, such as pears, apples, kiwi, oranges, grapefruit, grapes, gourmet crackers, gourmet cookies, gourmet cheese, raisins, peppermint patties and candies. Basket is tied with a complimentary bow. Prices start at $50. Need a gift for a "hard-to-please" person on your list? We can take your special requests and design a custom basket filled with gift items personalized especially for your friend or loved one. CALL EMERALD GARDENS FLOWERS TODAY at (919)286-9835 or (800)289-8570 to order a wonderful gift basket or to personalize your floral order with a nice add-on gift!